Today marks the first day of spring and it is also a time when Christians and pagans celebrate the anticipated changing of the seasons. In Dublin, a group of pilgrims walked from Dublin city centre to a sacred well in Clondalkin, while in Roscommon, Celtic druids were due to hold a super full moon ceremony. Traditionally, 1 February is a celebration of one of Ireland’s three patron saints, St Brigid. 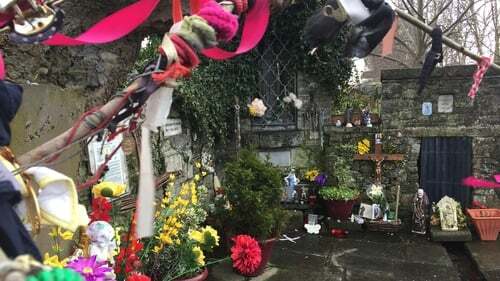 In Dublin, St Brigid's Day has been marked by a pilgrimage along an old route from the centre of Dublin to Clondalkin - the site of a religious well. Clondalkin woman Caitriona Leavy, one of the women organising the walk, said the celebration is important to the local community because the village's 'St Brigid's Well', which was nearly destroyed by a road alignment in the 1990s, is visited at this time of year by people from the locality. Today also marks ‘Imbolg’ – a pagan pre-Christian celebration that marks the change of seasons. Críostoír Mac Cárthaigh, Director of the National Folklore Collection at UCD, said the Celts celebration marked the ending of the dark period of the year. Psychotherapist Karen Ward, co-founder of Slí an Chroí, a school of shamanism based in Dublin said: "The Imbolg festival is synonymous with the energies of the goddess archetype of Bríd or Brigid. "In the coming days red cloths in her honour will be laid on the land to gather the healing power of the Imbolg dew. "On February 3rd at 9.12pm, the precise moment of cross-quarter time between Winter Solstice (21 December) and Spring Equinox (Mar. 21st) will occur. This is Imbolg." For many, St Brigid’s Day brings back childhood memories of making the ‘Brigid Cross’ at school. This small cross is usually woven from rushes and has four arms tied at the ends and a woven square in the middle. Clondalkin woman Gabriel Allen has made the crosses for over half a century. Every year, she teaches the tradition to school children at Gaelscoil na Camoige in Clondalkin. The Celtic Druid Temple held its super moon ceremony last night at Tara, Roscommon and Vienna.